Beautiful Noise is the art collection of Shunya Yamashita (山下しゅんや). It's basically a character illustration book. 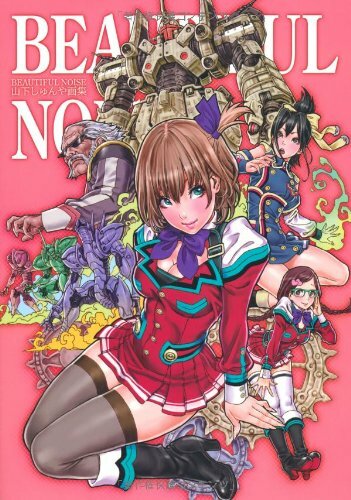 I would describe it as a pin-up book since more than half of the illustrations are of female characters. There are unpublished works as well as those commissioned pieces, such as from Marvel, Tekken Tag Tournament 2, and others. The art is beautiful. Shunya Yamashita has a nice and pleasing style and he illustrates girls very well. It's pretty cool to see some of the comic characters like Black Cat, Jean Grey in Japanese manga style. Great book if you like pin-ups and character art. many thanks for tipping me off to Beautiful Noise! I just posted a commentary and some scans on my little Nina Williams fan blog. I also used screenshots I took from your video, hope you don't mind. Naturally, I credited you and linked back to your review here and the video you uploaded. Anyway, great job on Parka Blogs!